Are you sick of the hassle & expense of your gas lawn mower? Maybe a cordless lawn mower would be a better fit – simply charge the battery, pull the trigger, and you're off! No more mixing cans of oil & gasoline, and repeatedly pulling the starting cord with all your might, only to have a surly gasoline motor refuse to start, will be a thing of the past. Cordless technology has changed rapidly over the last few years. Early cordless mowers used lead-acid batteries, which are heavy, don’t store much charge, and take many hours to recharge. The latest generation of lithium-ion batteries store much more charge, are less then half the weight of the older lead-acid models, and can be fully recharged in as little as 30 minutes in some cases. What Makes A Good Cordless Lawn Mower? After many hours of in-depth research & discussion with experts and home users, we believe the EGO Power+ LM2001 is the best cordless lawn mower for most domestic situations. It’s not expensive (comparable to a mid-range gas lawn mower), and its 20-inch wide deck, powerful 56-volt battery & 600-watt motor make it the best cordless mower available in our opinion. Our previous choice was the Black & Decker SPCM1936. Its replacement is the CM2040, which is still a fine product, however in our opinion, the newer EGO and Greenworks mowers are better products for a little more money. If you're looking for a cheaper electric option, and have an outdoor power point near your lawn, consider our corded electric lawn mower review. If you need more power than an electric mower can provide, have a look at our gas mower review. The LM2001 is the best cordless lawn mower we have tested. Unless you have a very large or very small lawn, or a restricted budget, we believe this is the best cordless mower for most people. The EGO Power+ LM2001 is an absolute beast. Its 56V power train and 20” deck width will make short work of your lawn. It features 3-in-1 operation (mulching, bagging, or using the side-discharge). The LM2001 can quickly be folded up for storage - when folded it takes up a tiny amount of floor space in your shed or garage. If (like mine) your shed is cramped on a good day, this feature alone puts the EGO ahead of its competitors. The included rapid charger will fully charge the 4.0Ah lithium-ion battery in 30 minutes, giving you 45 minutes of run time. If you have another EGO battery (either from another EGO yard tool - all of their batteries are compatible with all of their tools - or if you buy a second battery), you could pretty much mow lawn indefinitely, stopping only to change a flat battery out for a freshly charged one. In our opinion the EGO batteries are likely to last for many more charge / discharge cycles than any other cordless lawn mower. EGO simply use a much more advanced design, and pay more attention to detail with their batteries, than any other manufacturer. We expect this to change over the next few years, as other manufacturers catch up. Battery technology is currently changing at a rapid pace. However, that is the current state of play as we see it. Although EGO is a relatively new name in the power tool scene, it's part of a larger company (Chervon) established in 1993. Chervon is one of the largest power tool manufacturers in the world, selling over 10 million units a year worldwide, and other brands owned by the same group include Skil, Skilsaw and FLEX (the inventor of the angle grinder). EGO back this mower with a class-leading 5-year warranty on the mower itself, and 3 years on the battery. Battery life is one of the biggest issues affecting cordless mowers. The EGO model isn't as badly affected as other makes: you should get around 45 minutes of mowing time, and the supplied rapid charger takes 30 minutes to recharge the battery (faster than the rivals in this article). If you're used to a gas mower, it may surprise you to find the LM2001 is not self-propelled. Although it is significantly lighter than most gas mowers, which makes it easier to maneuver, there will be cases where a self-propelled mower is essential, and you may wish to look elsewhere - for example, the manufacturer doesn't recommend using this model on slopes greater than 15 degrees. Although the LM2001 is weatherproof, so you can use it on damp grass, it is not recommended to clean the underside with a hose, as you can do with gas mowers. This mower uses a brushed motor, instead of the more modern brushless motors used by some of the competition. Brushless motors are very slightly more efficient than brushed motors, and brushless motors also require less maintenance. However, EGO state that the brushed motor in this mower should not require the brushes to be replaced during the life of the mower. The EGO LM2001 uses a single 56V battery compared to the 2x 40V batteries used by the Greenworks 25302, and the EGO battery is likely to last longer before needing replaced (in our opinion). EGO batteries are compatible with all EGO yard tools, whereas the Greenworks batteries are only compatible with some other Greenworks tools. The EGO battery takes 30 minutes to charge, while the Greenworks batteries take either 1 hour (2Ah battery) or 2 hours (4Ah battery). 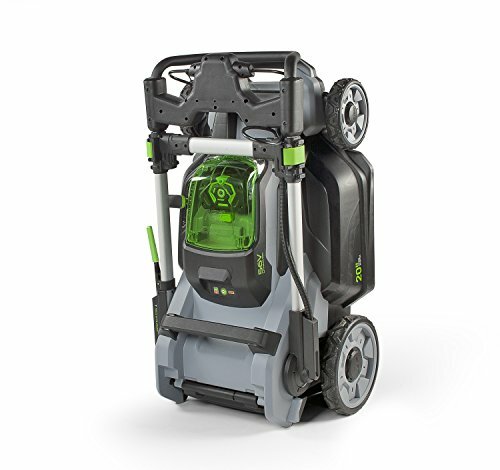 You can operate the Greenworks mower on 1 of the 2 supplied batteries while the other is charging, whereas the EGO only comes with a single battery. 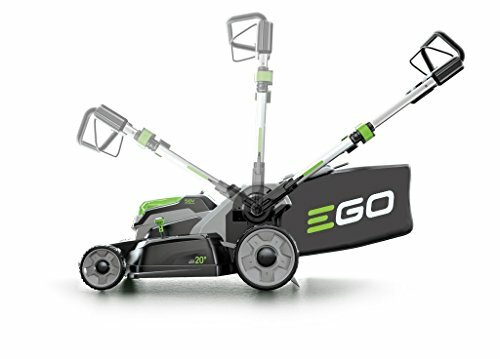 The EGO mower has a longer warranty than the Greenworks model (5 years vs 4 years). The Greenworks 25302 Cordless Mower is an unusual design. Although it looks conventional enough, the “Twin Force” name gives a clue to the different design direction Greenworks have taken. 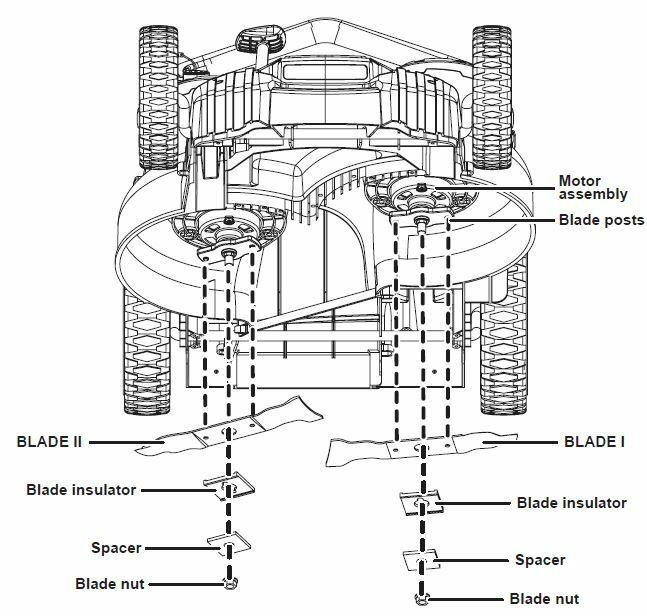 Instead of a single, large blade, the 25302 is fitted with two cutting blades, each rotating in opposite directions. Each blade is powered by its own electric motor. The 25302 also comes with two lithium-ion batteries, which can be used together, or individually, so you can have one installed on the mower and one recharging at the same time. 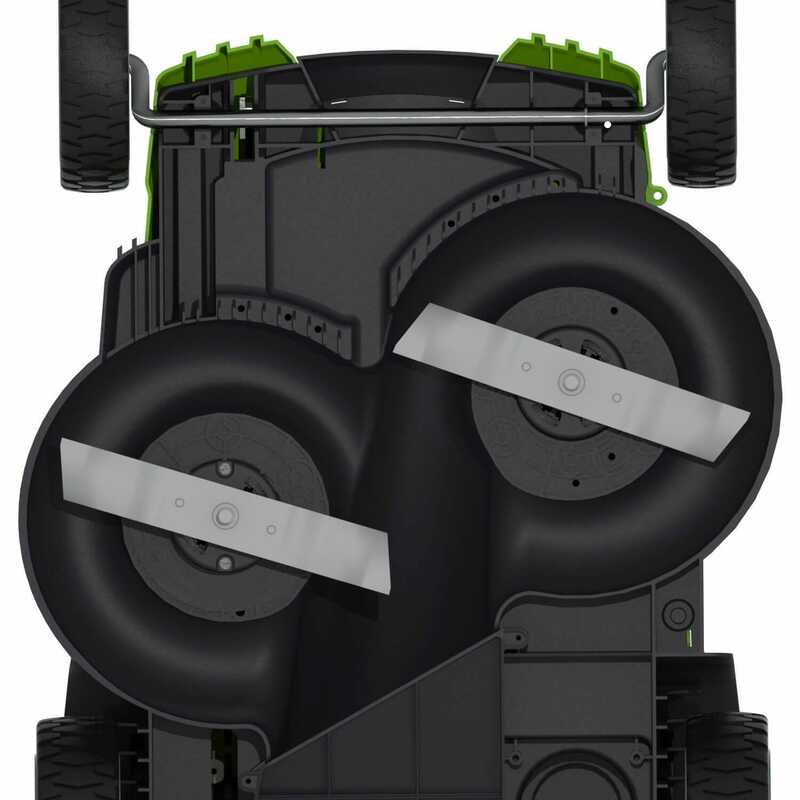 Greenworks claims the twin-blade concept offers “better cut quality, superior mulching and bagging capabilities”. There is some debate about whether this is true – on the one hand, there is a lot of user criticism about this mower missing the occasional blade of grass where the two blades almost meet in the middle, resulting in multiple passes or having to overlap, to get a clean cut. High blade speed is very important to a good, clean cut, and if all other factors are the same, a 10” blade tip will be travelling slower than a 20” blade. However, some users point out that if you make sure the grass is dry when you cut it, the problems disappear. The twin battery concept, on the other hand, is a clear benefit in our opinion. The 25302 is supplied with 2x 40-volt batteries – one with 4 amp-hour capacity, one 2 amp-hour, and a single charger. The 2Ah battery takes around an hour to fully recharge, while the 4Ah battery takes twice as long. It’s important to note that you can only charge a single battery at a time with the included charger, so a full recharge will take around 3 hours – compare this to the 30 minutes the EGO charger takes. If you have any other Greenworks G-MAX 40V tools, you could charge one of the batteries with the charger from the other tool, as all G-MAX 40V batteries are compatible. Otherwise, this mower is a fairly conventional cordless model. It is not self-propelled, but at only 42.5lb it doesn’t really need to be, it’s light and easy to maneuver. You can either collect grass clippings in the supplied catcher, or you can use the mulching attachment. The cutting deck is a large 20”, which helps you save time, as you can mow a larger area in one pass, compared to smaller mowers. This mower is also available in 19” and 16” sizes. Greenworks backs the 25302 with a 4-year warranty on the machine, and 2 years on the batteries. The CM2040 is a more conventional, single-blade design than the Greenworks mower. It doesn’t suffer from the issue the 25302 struggles with, namely the occasional few blades of grass missed, in the middle of the cutting path. However, it can struggle in some situations that the EGO LM2001 powers through, suggesting the CM2040 uses a less powerful motor. Like other similar cordless mowers, it starts instantly, and you can either collect the grass clippings in the included grass catcher, use the mulching attachment to return them to the lawn, or discharge them for later cleanup using the side discharge. The major flaw with this mower is the charging time. It takes around 2 hours to fully recharge a flat battery, and you can only charge one battery at a time using the included charger. While this is faster than the older generation of cordless mowers using lead-acid batteries could be recharged, it is uncompetitive compared to modern alternatives. Some users report this mower can struggle to get through as little as 1/8 acre before both batteries need recharging, which adds a significant delay to what should be a reasonably quick job. This depends very much on the type of grass being cut, how short you’re trying to cut it, how long between cuts etc. However, it is something to be aware of. We think the CM2040 has been left behind by the latest generation of cordless mowers, but if you can pick one up for a good price, and only expect to use it for light duties, or if you’ve already bought into the Black & Decker 40V MAX battery system, this model may make sense. 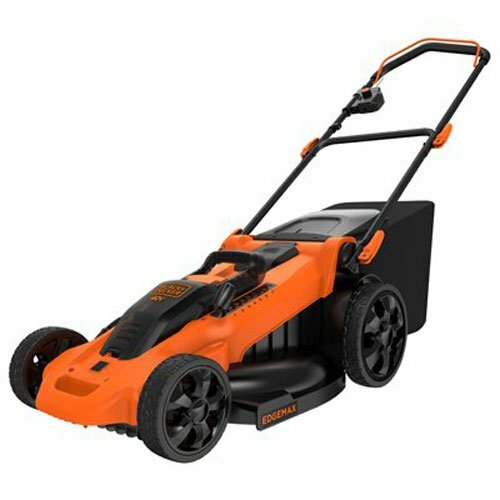 Black & Decker back this mower with a 2-year warranty. The WORX WG775 is our favourite budget cordless mower, usually found for around half or less of the cost of our top picks. With a cutting width of 14”, it will not cut large areas as rapidly as the larger mowers, however this mower makes up for the deficit by being convenient to use. It’s lightweight at 33lb, and easy to handle. 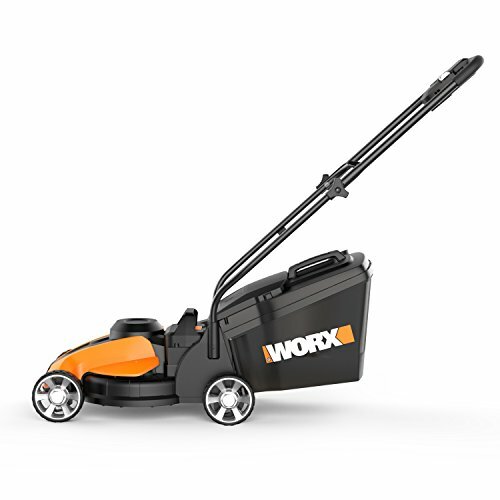 A single charge can provide up to 30 minutes’ run time, and WORX claim it can cut up to 6000 feet of lawn. I'd be sceptical of this claim - 6000 square feet is close to 1/6 of an acre - if I was mowing that much grass, I wouldn't be relying on a budget mower with a 5 hour recharge time! There is no need to yank a starting cord with this one – being electric, it has a button starter. The ergonomic handle which inclines at an upward angle facilitates better control and lessens fatigue during use. Perhaps you're on a tight budget, have a small lawn, and can't justify the investment in a separate mower, trimmer and edger? If so, Black & Decker might have the answer in the MTC220. This unusual device converts instantly between mower, trimmer and edger. While it can't do as good a job as a conventional mower (it doesn't use blades to cut the grass, instead using the same nylon string as a string trimmer), it may be enough for your needs. It's lightweight, easy to handle, and it's small size is great for storage. It comes with an included battery and charger. This model is also available as a corded electric device, for a lower price. Black & Decker provide a 2-year warranty. Cordless lawn mowers have most of the same advantages as electric mower﻿s - lighter weight, and significantly quieter than gas lawn mowers. The lack of expensive ongoing maintenance is another plus. Recent advances in battery technology (in part driven by Tesla) have made some cordless mowers as powerful as corded electric models, and in many cases they can substitute for gas mowers, even for a large lawn area (up to 1/2 acre for some models). The main advantage over a corded electric lawn mower is the lack of a power cord - where you're confined to within 100' of a power outlet with a corded mower, you can mow anywhere with a cordless model. No cord getting in the way means no trip hazard, and no chance of it becoming entangled in the mechanism of the mower. Storing the mower for the winter months is also less of an issue than with a gas mower - there's no gasoline tank to empty, no fuel stabilisers to worry about, and the mower itself will take up less space in your shed or garage. Starting an cordless mower is easy - just pull the lever or trigger and you're away - no pulling the starting cord of a reluctant gasoline engine! Cordless mowers do suffer from limited run time between charges, something that doesn't affect corded electric mowers. Gas mowers also have limited run time, however it take a few moments to refill a gas tank, compared to 30 minutes to several hours for a recharge, depending on your cordless model & whether you have multiple batteries. You do have to think about storing, charging and replacing Lithium-Ion batteries after a couple of years (or worse, having to replace a perfectly good mower because the manufacturer has changed the battery style and no longer supports your model!). Replacement batteries can be expensive, and it's a good idea to check the replacement cost before buying your mower. The other disadvantage of an electric lawn mower (both cordless & corded) is the lack of ultimate power & cutting ability compared to gas mowers. If you have a large area to mow, or if your grass gets particularly long or thick, you should consider a gas lawn mower. Our buying guide will make sure you're informed before you decide which model is best for you. The longer your mower can run between charges, the sooner your lawn will resemble a bowling green. Older mowers may only be capable of 15-20 minutes between re-charges - more modern versions can give you up to an hour, possibly even a little longer. Although there are differences in efficiency between different makers and models, these differences are slight compared to the main factor determining the run time - the amount of charge stored in the battery. In case you're wondering how a sustained 224-watt output for 1 hour gives you a 45-minute cutting time with a 600-watt motor in the EGO's case, the answer is the motor is not working at full load for the entire 45 minutes in the real world. If you somehow managed to run the EGO mower at full load continuously (i.e. without turning corners, without any variation in grass length or thickness etc), it would only last a little over 20 minutes before needing recharged. Only a few years ago, when early mowers were powered by heavy, inefficient lead-acid batteries, you could only expect about 15-20 minutes of run time from your battery, and it could take several hours to fully recharge it. So if you had an hour's worth of mowing to do, it could potentially be an all-day task. Nowadays, some mowers can last over an hour between charges, and their intelligent chargers may only take 30 minutes to recharge. If you buy one of the better mowers available today, charging time isn't really a concern. If you buy an older or cheaper model, this may still be an issue. If you think you will need a second battery, check the retail price before you commit to a blower - some manufacturers charge more than others, and the batteries aren't usually interchangeable between different manufacturers. In any of these cases, you may be better to consider a smaller mower. Larger mowers generally have more powerful motors; however, this is not always the case, so it pays to check the motor size before you commit to a particular model. 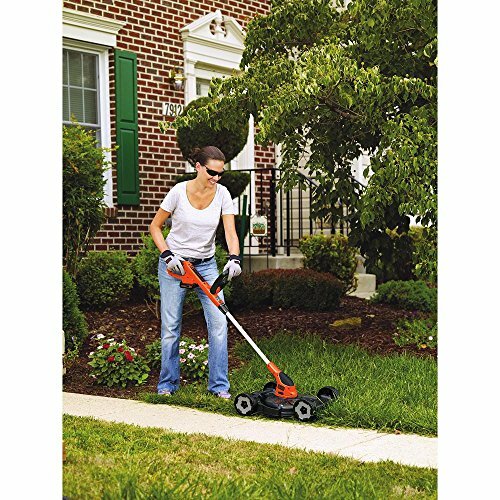 The EGO mower in this review has a 600-watt motor. Unfortunately, not all manufacturers are happy to publish their motor ratings. We have contacted all the manufacturers in this review & will update the motor ratings when we have them. There is a trade-off here: the more powerful batteries and motors, featured in the latest mowers, can add quite a bit of weight. Cordless mowers are usually quite a bit lighter than their gas equivalents though, however it’s worth bearing in mind. Longer is better (obviously). Check the fine print for conditions attached to the warranty, e.g. would you have to return the mower to a distant service location if it broke down? Would the maker repair or replace it? One of the big advantages a cordless mower has over a traditional gas model is the lack of maintenance. Almost all the maintenance requirements of a gas lawn mower are related to the engine. You should remove loose grass from the underside of the mower once you've finished, before storing the mower. Make sure the battery and / or key (if fitted) is removed before you do this. You can use a stiff brush. If you have an air compressor, a quick blast of compressed air helps avoid any build-up of lawn clippings on the underside of the mower, and helps keep it looking like new. You could also use a leaf blower for the same task. You should check the mower for loose or worn parts before every use. Try not to store the battery fully charged - if possible store it slightly discharged and give it a quick top-up before use. Don't leave the battery completely uncharged for any length of time - while Li-ion batteries don't self-discharge very quickly, once your battery voltage drops below it's lowest safe limit (around 30V for a 40V battery), it cannot be safely charged again, and you'll be out $200+ for a replacement. Don't store the battery in a hot place - one of the biggest enemies of Li-ion batteries is heat, particularly being stored fully-charged in a hot place. If you really want to go the extra mile, work out how long it takes to both fully charge your battery, and to drain it using the mower. Once you've worked this out, use a timer when you're using the mower, and when you're charging the battery. Try to stop using the mower when the battery still has 20%+ left, and take it off the charger when it's about 80% charged (if this still allows you to mow your entire lawn). It seems like a lot of hassle, but the potential improvements the useful life of your battery are spectacular. Don't let this put you off getting a cordless lawn mower - if you just follow the manufacturer's instructions you should get a few years' life from the battery, however a bit of extra care does pay dividends in this case (in the region of 2x the battery life just for the 80% charge / 20% charge tip alone). Occasionally faults are discovered after a product has gone on sale, usually requiring the product to be recalled by the manufacturer. The Greenworks 25302 was the subject of a recall in May 2017. The recall notice states there is a fire hazard, caused by a possible short circuit in a circuit board. The recall affects mowers built between April 10, 2014 and July 17, 2015. Any of these mowers sold since May 2017 should not have this issue (it is illegal to continue to sell a defective appliance to the public, once it's subject to a recall notice). However, if you are at all concerned, it's best to contact the manufacturer. ​More information at the Consumer Product Safety Commission website. 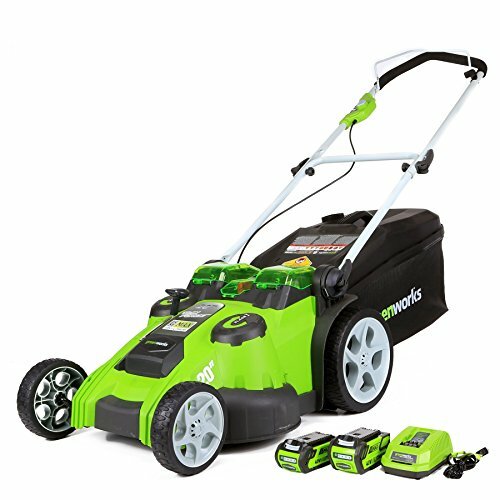 Do you own any of the cordless mowers mentioned here? Did you choose a different one? Let us know in the comments! How Does a Lawn Mower Work? How Does a Leaf Blower Work?